Collecting three radically different pieces, Bow To Strings, Processions and Skelja, this album, Bjarnason’s debut as a composer, is a particularly vivid and rich example of modern composition at its exhilarating best. While Nico Muhly’s work is resolutely anchored in American composition, Bjarnason’s heritage is unmistakably European, and his interpretation of it is flamboyant to say the least. A piece for multi-tracked cello in three parts written for Sæunn Þorsteinsdóttir, Bow To String is at once brutal and exquisite, angular and melodic, pulsating with electric frenzy in its first segment, stripped right down to minimal textures, with occasional build up of more concrete motifs in its second, pastoral and introspective in its last. Þorsteinsdóttir’s expressive performance perfectly serves Bjarnason’s contrasted palette, giving it a scope as vast and dramatic as Iceland itself. Processions, which follows, again a triptych, was written for pianist Vikingu Ólafsson, and performed with the Icelandic Symphony Orchestra and is again a particularly vibrant piece, especially in the first and last movements, where Ólafsson is often left fighting against the relentless tide of the orchestra, occasionally taking the opportunity of a moment of calm to take control. In the ten and a half minute of In Medias Res, the first of the three movements, Bjarnason displays a particularly vast array of tones, ranging from contrasted and melodic moments to strong orchestral surges or extremely delicate and intimist sections, before concluding on a harsh thunderous last stab, leading to the more evocative and peaceful Spindrift, which gives a chance for orchestra and piano to carve some stunning emotional moments. The last part of this piece returns to more angular orchestral form, but here the voluptuous piano formations appear to work more in symbiosis with the orchestra. Concluding this album is Skelja, a relatively short piece for harp and percussion performed by Katie Buckley and Frank Aarnink. Much more introspective than the two other compositions, it focuses primarily on restricted harp lines, the percussion acting as a source of textures in the backdrop rather than as a rhythmic element. A stark contrast to the more vigorous Bow To String and Processions, this last piece reveals a much more fragile and minimal side to Bjarnason’s work and opens this record up to a very different ground. 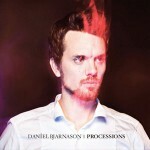 Processions introduces in Daníel Bjarnason a major new modern classical composer, who already has a strong personal sense and a very defined vision. While the varied aspect of the three pieces makes for a slightly disparate album, they showcase his compositions to particularly convincing effect, making Bjarnason an essential addition to the Bedroom Community collective.